The Walk follows the street artist Philippe Petit (played by Joseph Gordon-Levitt), and shows us how he evolved into a legendary high-wire artist. Along the way, he meets a lover, friends, and partners – and together they all embark on a mission to illegally perform a high-wire between the two towers of the World Trade Center back in 1974. Petit becomes particularly obsessed with these towers, and this obsession threatens to end the group. Their great coup changes all partners, for better or worse, and this coming-of-age coup ends up revealing what Petit’s obsession truly means to him. 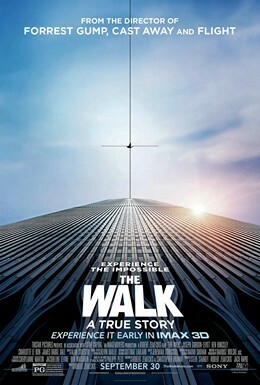 The Walk is an extraordinary film led by its stunning visuals, which will both frighten you and take your breath away. But this biopic never loses sight of Philippe Petit – and Joseph Gordon-Levitt’s performance never disappoints. I went into the IMAX theatre fearing that Gordon-Levitt’s French accent would destroy the film for me, but I was comforted by the way he pulled it off. He perfectly captures the mood of every scene, both on and off the wire, and, ultimately, gives one of the best performances he has ever given as a leading man. The one word that perfectly captures this film is breathtaking – this film really excels on the wire itself. Robert Zemeckis, Dariusz Wolski, and Joseph Gordon-Levitt should be commended for the incredible work on the wire, as it perfectly captures every moment and emotion of need. And while there are some hiccups – with Petit’s vision of a bird, as an example – the film remains strong and easy, yet frightening. The very best scene in the entire film takes place right as Petit is about to step out on the wire. His view comes perfectly into play here, as his focus on the wire and the ‘void’ overtakes the screen, before he takes his first step into reality. We are guided through his real life American Dream through voice-over, and, sadly, too much of it. There is such a thing as over-explaining something overt, and this film has a tendency to do that. But I would argue that the way the film ends justifies the use of Gordon-Levitt’s Petit as a storyteller. In the end, this film is based on a book by Petit, and that is definitely apparent – for better or worse. I enjoyed The Walk very much, yet it is definitely far from being a perfect film. The dialogue feels cheap and exaggerated at times, and the score, while serviceable, is not one to remember. But this film just doesn’t let go of you. Zemeckis has managed to create a film that is both visually stunning, well-acted, growth-driven, and classy. And no moment makes that more clear than the very last. This is a love story about the World Trade Center, with a French man taking the towers into his heart and never letting them go. This film ends on a quiet and touching note, but this moment is very classy. This final moment works, because Zemeckis might have performed the ultimate magic trick over the course of the film. For a brief moment, he might make you forget that the towers are no longer there. Final Score: 8.6 out of 10 – Robert Zemeckis’ The Walk is both incredibly breathtaking and perfectly classy.